How will LeBron James fit on the Lakers? How about the Rockets? The Crossover breaks down free agency scenarios for the King. When LeBron James becomes a free agent, he captures the imagination of an entire league. No player runs further with a premise like "What if...? ", because adding LeBron to your team puts everything back on the table. That fanciful offense that most don't have the precision or basketball literacy to pull off? James can make it look easy. The defensive scheme that seemed too outlandish—that relied on a big to cover the floor like a guard? James can make it real. His game is a gift for the coach dreaming up wild new plays on the back of a napkin, the executive looking for ways to elevate a patchwork roster, and the fan anxious to see how their favorite team comes together. Everywhere he goes, LeBron brings a level of basketball coherence. The way he plays is so transformational and so adaptable as to unlock the best in things. Having LeBron on your team as a catch-all basketball mechanism doesn't mean that anything is possible. It means that everything is possible. Put LeBron on the Lakers and you empower a team in transition with unparalleled flexibility. Rob Pelinka and Magic Johnson could broaden their view of potential fits based on how much cover James gives his teammates. Your point guard no longer has to be held to the standards of a lead playmaker. Shooters—even those with hyper-specialized games—become more valuable across all positions. Energy bigs who might have once seemed too limited or too inconsistent can suddenly work as starters on a high-level playoff team. You could keep Lonzo Ball around to help run the offense, or trade him for a player of an entirely different kind. Ditto for Brandon Ingram or Kyle Kuzma. The reason why Cleveland had been so aggressive on the trade market since LeBron's return is that you create so many possibilities for deals just by having him on the roster. There is an urgency that comes with wanting to give James the best possible teammates, but even greater is the freedom he grants a team to reimagine itself. Cleveland could trade away two different star point guards in a single season while turning over more than half its roster and still make it to the Finals. The redundancies and flaws that teams grow to live with suddenly become solvable. Put LeBron on the Sixers and you position an up-and-coming team for matchup dominance. What makes the Warriors so challenging to play against is the way they filter down the pool of usable players. Cumbersome, traditional centers are played off the floor. Guards who can't defend are put into a grinder of off-ball screens and made to chase Steph Curry. You need to maximize your shooting on the floor to keep pace with Golden State, but Klay Thompson and Kevin Durant are so tall and so long that they prevent opponents from overloading on smaller guards. Every opposing roster is squeezed from both sides at once. With James, the Sixers could come to a similar effect from an entirely different angle. Philadelphia could start a fully functional lineup—of LeBron, Joel Embiid, Ben Simmons, Dario Saric, and Robert Covington—in which every player is 6-9 or taller. The rest of a perimeter-oriented league would have nowhere to hide their guards and wings, creating some dramatic mismatches with little recourse. Every team in the league is on the hunt for athletic, switchable wings, but the value of their switching is mitigated when the Sixers have baked-in size advantages across the board. You might cover the gap between pick-and-roll, but little can be done to slow bigger players with a complete floor game. James and Simmons could work as dual playmakers and devastating cutters. If you think it's hard to stop LeBron on the drive with a full head of steam, try rotating an entire defense in response to him slipping backdoor. The same goes for Simmons, who made better han 77% of his shot attempts off of cuts last season, per Synergy Sports. The question with any offense based on off-ball movement is not efficiency but accessibility; it's not a matter of whether players can convert shots, but whether they can get the ball consistently enough to even attempt them. Having two of the best passers in modern NBA history obliterates the premise. Opponents might pack the paint out of necessity, though every lean away from a player like James, Simmons, or Saric becomes an opportunity. Forcing a defense to account for Embiid, in addition to all this, could break even the best-devised schemes in half. Put LeBron on the Rockets and you alleviate most every problem facing Golden State's greatest challenger. It would take some doing (read: an elaborate trade) to get him there, but logistical isues won't hold against LeBron's will and Houston's transactional creativity. If James decides that the Rockets are the team, a way there will be made. 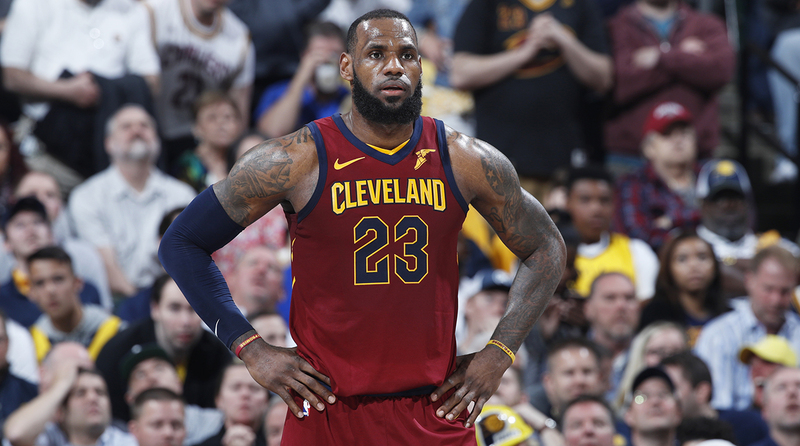 LeBron James Predictions: Where Will He Go in Free Agency? With his arrival, the concerns of last season would be deemed irrelevant. Should Paul get hurt, Harden and James could easily carry a conference champion. In the event that Harden fades over the course of a playoff series—one made more unlikely by his lighter workload—it would only allow LeBron to do what he does best. To bolster this roster with a third superstar would make it something close to calamity-proof. You worry less about depth and injury when you have three All-NBA-caliber talents capable of filling minutes as needed and making all of their teammates better in the process. Any questions about the "your turn, my turn" nature of pairing ball-dominant stars has already been asked and answered. Houston runs a pick-and-roll heavy offense that all but forces opponents to switch. Their frequent isolations were a byproduct—one that was expected, if not necessarily preferred. The Rockets ran their stuff, their opponents made (often fatal) compromises, and Harden and Paul feasted against defenders ill-equipped to stop them. LeBron did more or less the same thing throughout the Eastern Conference playoffs, albeit with less support. Flank him with other creators in proper spacing and James could actually raise the ceiling of a historic offense. His pinpoint passing would be a best-case vehicle for setting up Houston's three-point specialists, and his own shooting would help keep the lane clear for Harden and Paul. All three stars are brilliant with the ball in their hands and demanding without it. You can't help off James or Harden or Paul, nor chase them off the arc to any great success. The best a defense can do is to stay attached, which plays right into the hands of the team creating and attacking mismatches. The thought experiment extends to every team, realistic or not. LeBron could revolutionize the Blazers as an exorbitantly rich man’s version of Evan Turner. So much of what holds back the Spurs would fall away with James at the center of everything. The Bucks could take the leap behind two generational talents. In joining teams like the Pacers or the Jazz, LeBron would make trapping defenses a non-starter—creating even more room for Victor Oladipo or Donovan Mitchell. The Warriors could gentrify the NBA in one fell swoop, pricing out every would-be superteam in the process with a product that might be literally unbeatable. James will likely make his decision known in a matter of weeks. One team will be vaulted toward contention and all that comes with it. The pressure that surrounds LeBron is undeniable; all involved understand the potential he creates. They've seen it first-hand through eight straight trips to the Finals, the latest of which came with a deeply lacking roster. They know it because every time it looked as though James might change teams, they allowed themselves to imagine what the greatest player of his generation might do for theirs.